Sauté one finely chopped medium onion and the peas in 40 g of butter until softened. Add one glass of dry white wine and reduce. Add 1 litre hot chicken or vegetable stock and simmer, stirring occasionally. After 14 minutes the stock will have been absorbed, the rice will be cooked and creamy, yet retaining a desirable crunch in the centre. Stir through grated Parmesan cheese and Pesto, then serve. You can garnish the plate with fresh basil leaves and sautéed prawns. Goes well with any kind of dish, be it vegetable-, meat- or fish-based. Traminer, Soave, Sauvignon blanc, Pinot grigio, Riesling or Dolcetto Monferrato. For a less 'al dente' consistency add a ladleful of the hot stock and simmer until absorbed, continue in this way until the rice has reached the desired consistency. 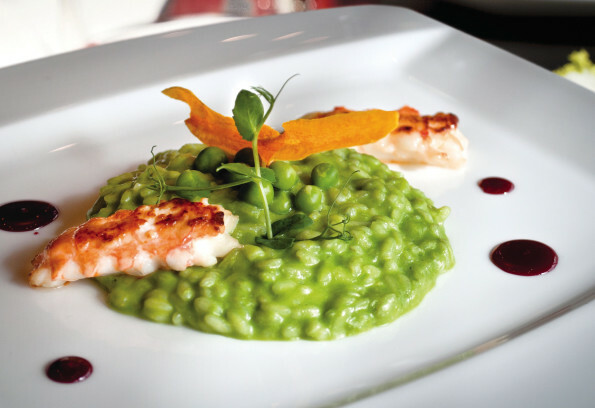 This easy and tasty risotto recipe is ideal in spring and summer, when fresh peas are in season and can be bought directly from the producers, without having to resort to frozen ones. The delicate flavour of these wonderful green legumes well matches the more savoury Pesto and Parmigiano, providing an incredible taste experience.